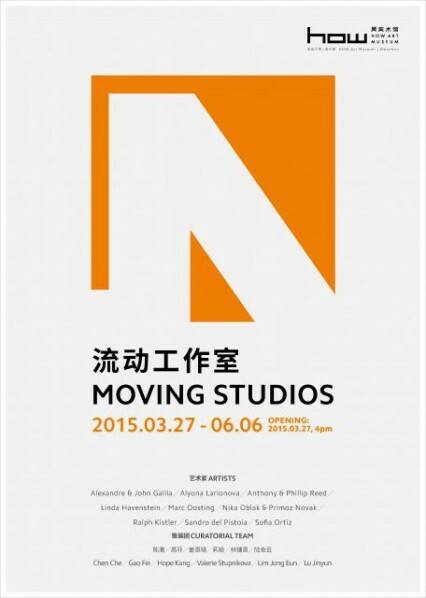 HOW Art Museum presents first exhibition in 2015 – “Moving Studios”. The exhibition seeks to analyze the reasons of massive popularity of residency programs, as well as to see how artists at the forefront of their generation are responding to a highly globalized world. Having been living and working in artist residencies in Shanghai or Seoul, nine artists from eight different countries participate in the exhibition – Alexandre & John Gailla, Alyona Larionova, Anthony & Phillip Reed, Linda Havenstein, Marc Oosting, Nika Oblak & Primoz Novak, Ralph Kistler, Sandro del Pistoia, and Sofia Ortiz. They experienced the communal atmosphere of the residency, and it would be interesting to know their interpretations and ideas on the issue of assimilation and dissimilation in different cultures. Trough a wide array of works, this exhibition will explore whether artist-in residence programs can provide a truly immersion into another culture and create a positive interaction between local community and foreign guests. Members of art community, like the world itself, are largely ‘globalized’. Artists, curators, critics, and managers travel and spend most of their time exploring cultural and economic realities of those cities where art flourishes: New York, Miami, Hong Kong, Shanghai, Seoul, Tokyo, etc. ‘Nomadism’ and expanding network are distinguishing characteristics of contemporary art life. French art critic and writer Nicolas Bourriaud states that “contemporary culture can no longer be seen as a single totality, but as an interrelated network – described as an archipelago. It is both unified and separated: an example of the relationship between one and many. Islands of thoughts and forms are clustered together, yet they may not have a total ‘continental’ definition.” “Islands of thoughts and forms clustered together” – this depiction expresses exactly the essence of residency programs whose aim is to gather creative people and involve them in thinking process and discourse formation. As for artist-in-residence programs, they similarly attempt to revitalize international exchanges and enable artists to move from their usual environment to new places. They allow exploring life in different counties, meeting new people, establishing relationship within another community. Moreover, they focus on incubating emerging artists and encouraging their innovation and experiment in art. The exhibition explores this idea of portable studios and art inspired during relocation. “Moving Studios” lasts until June 6th, 2015. Courtesy of the artist and How Art Museum.